A woman in Florida said she gave her attacker an ultimatum. camera (ABC News) A Tampa, Fla. woman chooses to embarrass her alleged attacker by having him hold a sign that says "I beat women. Honk if I'm a scumbag." 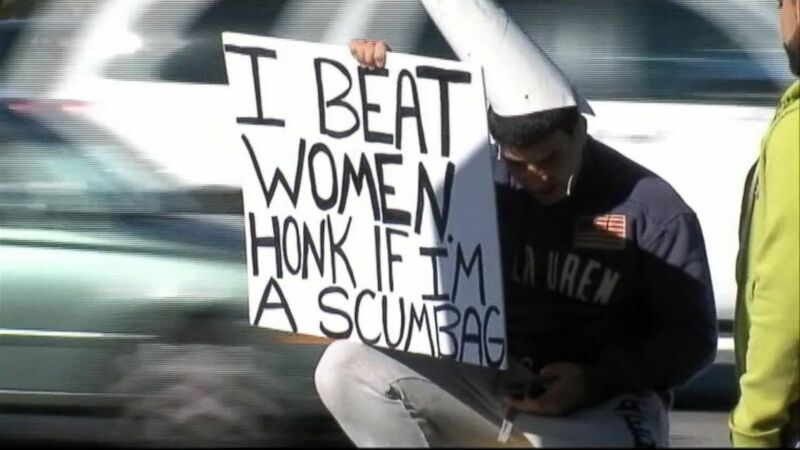 Drivers passing through a busy intersection in Tampa, Fla., this week may have caught sight of a man wearing a dunce cap and holding a sign that read, "I beat women. Honk if I'm a scumbag." A woman in Florida said she gave the man who attacked her last weekend the choice of getting arrested or sitting on the street for eight hours with the ensemble. "He's doing it because he doesn't want to go to jail," Alisha Hessler, 20, told ABC affiliate WFTS-TV in Tampa. Hessler said she met the man last weekend when her two male friends brought him along for a night out clubbing, WFTS-TV reported. On the way home, she said he tried to reach up her skirt, but she said "no" and tried to push him away, Tampa Police Department Lt. Ronald McMullen told ABCNews.com. The man allegedly wouldn't stop until she slapped him, McMullen said. "That's when he started beating me repeatedly until I had a broken nose and a concussion," Hessler told WFTS. Hessler told ABCNews.com that her friends left her in front of her home when she told them she was going to call the police. The next day a police report was filed and Hessler went to the hospital for her injuries. The detective told her that he needed the doctor's diagnosis to file a felony battery charge, McMullen said. But Hessler found the man on Facebook and gave him an ultimatum: public humiliation or an arrest. "He was wasted and I did hit him first because he was groping me and he wouldn't stop. I feel like if he was sober he wouldn't have done that," Hessler told ABCNews.com. McMullen said Hessler signed a complaint withdrawal on Thursday. "She chose to take care of it herself. She chose not to press charges," McMullen said. Mindy Murphy, CEO of The Spring of Tampa Bay, a domestic violence center, said the man's roadside display was problematic. "There's so many problems with this," Murphy told WFTS. "Women die every day at the hands of abusers. Sexual assaults occur every day. The fact that we've got a guy sitting in a dunce cap with a sign on the side of the road really is trivializing a serious issue." When asked if she feels vindicated after the incident, Hessler said no. "I feel that it's not enough honestly," she said. "There was one more thing I wanted to do, but I didn't because I was afraid it was too risky." Hessler said she wanted to have the man who beat her sign a waiver allowing her to beat him for 10 minutes. "But people said it was too risky, even if he does sign the waiver," she said. As for the two men she thought were her friends, those two and the man who beat her also had to take part in a punishment. Hessler said she had them clean her house for three hours this week.